Judges and sponsors of the Win This Space entrepreneurial competition met yesterday (January 19) at Catalina’s in downtown Peterborough to review 41 entries and have narrowed the competition to 10 finalists. 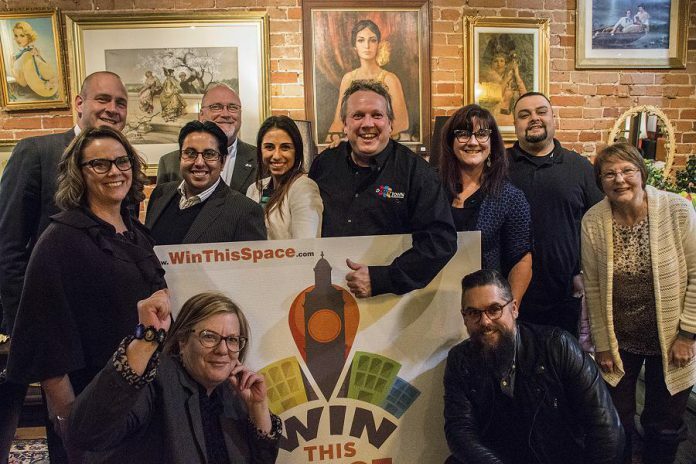 The Win This Space competition was launched in October by the Peterborough Downtown Business Improvement Area (DBIA), Peterborough Economic Development, Community Futures Peterborough, and StartUp Peterborough as a unique way to support local entrepreneurs and spur economic development in Peterborough. Contestants were asked to submit a one to three-minute video pitch by January 13th, which the judges would use to help select the finalists. The 10 finalists will go through a series of workshops on building business plans, creating marketing plans and financial forecasting. The $35,000 prize package includes not only a free lease to a downtown storefront for a year, but also thousands of dollars in donated prizes including office and computer supplies, marketing and financial services, and advertising and digital platforms. The prize package is being funded with the help of sponsors, some covering the cost of a month’s lease and others donating funds to support the program or to provide additional prizes for the winner. kawarthaNOW is pleased to participate as one of the Gold Sponsors for the competition. The winner of the competition will be announced Thursday, February 16th at The Venue in downtown Peterborough and will get the keys to their new space on Saturday, April 1st.